Sally Army, Motherfvnker, Suki Silvertongue, Sienna Potter, Roma, live poetry, short film, and panel discussion. 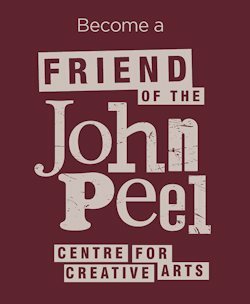 John Peel Centre is proud to present International Women’s Day 2019. A huge festival flavoured event that features an all star female cast of local musicians, poets, storytellers, and artists. The event starts early at 6pm with two talented young singer songwriters from the local area, Roma and Sienna Potter. They will be performing a mix of covers and originals, in their own distinctive styles. Come early and see the stars of tomorrow, before they were famous. We will then be treated to a short film screening ‘FCR presents: Women in the Creative Industry’ (rating TBC), by Suffolk’s own Freya Roy, and Emilie Scott Burgoyne. This film will spark the panel discussion featuring six entrepreneurs, from a variety of cultural and creative sectors. They will be discussing their experiences as professional women who have crafted unique careers. We are delighted to welcome Kim Trotter (Future Female Society), Becky Marshall-Potter (FolkEast), Remi Morrison (Red Cactus Media), Nichola Adams (Jimmy’s Festival), Bessie Turner (artist/musician), and Angelle Joesph (artist, presenter of BBC Suffolk Introducing). After a short break, the later evening segment will feature performances from three funny and fearless poets: Allanah Jo-Ann Peck, Hazel Thomas and Amy Wragg. Followed by a special ukulele jam and singalong from Ells Bells, who will be treating us to covers of some of the best popular songs by famous female artists. Words and chords will be provided. Bring your own ukulele to join in. We are delighted to welcome to the stage two of the best bands around. First up is Motherfvnker, Vania Lima’s Suffolk based funk band reviving classic, oldskool funk and disco music. Expect some classic songs mixed in with some of their own tunes too. Wear your best dancing shoes cos you’re guna need them. To finish the night off we have the awesome Sally’s Army taking the stage. One of the highlights of the SoapBox stage at FolkEast 2018, legends have already sprung up about their headline performance, and the antics that may or may not have taken place. As well as looking fabulous, they play fun, cheeky songs about vital subjects in contemporary society like the importance of tea and biscuits, and why Barbie has stopped shaving her legs. Some adult language and themes after 9pm. This event is supported by the Suffolk Centre for Female Entrepreneurship, and sponsored by www.getonthesoapbox.co.uk, who will decorating the venue with their handmade art from recycled materials. All ages (and genders!) welcome (under 16 yr olds will need to be accompanied by an adult). Tickets are £8 in advance (*£5 for under 18s and NUS – valid ID required on the door), available from the Box Office on 01449 774678 (10am-2pm weekdays) or online through our ticket partner, WeGotTickets (10% booking fee applies). Please note that advance sales will end at 4.30pm on the day. £10 on the door (no concessions).